DR 100 955-4 (former Kö 5755, LKM 49827/1952), photographed at the Eisenbahnmuseum Weimar on May 24, 2008, by someone who wishes to be known as Bf110 (source: www.commons.wikimedia.org). In 1946 former Potsdam-Babelsberg works of the Maschinenbau und Bahnbedarf Aktiengesellschaft (MBA, formerly Orenstein & Koppel) re-commenced production of motive power. Initially narrow-gauge class Gr locomotives for the Soviet Union were built, as a part of war reparations. In March 1948 the establishment, re-named VEB Lokomotivbau Karl Marx (LKM), became a part of the Vereinigung Volkseigener Betriebe des Lokomotiv- und Waggonbaus, known as LOWA. 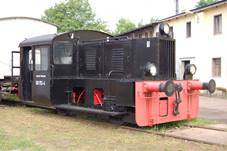 In early 1950s manufacture of small diesel switchers was commenced, based on pre-war designs. Type N2 (30 hp) was built in small numbers, probably only eleven examples. Larger types N3 (60 hp) and N4 (90 hp), developed from standardized Kleinlokomotiven of the Lg II power rating group, fared better, 110 and 253 examples being built, respectively. Most went to industrial establishments in Eastern Germany, but many were exported. Type N3 remained in production from 1952 until 1956. Eighteen examples were exported, to Czechoslovakia (five), Hungary (two), Romania and China (single examples) and Poland (nine). Polish N3s were purchased via Metalexport foreign trade enterprise and assigned to various industrial establishments. Due to introduction of indigenous locomotives with similar performance from Fablok (mainly Ls60, built in fairly large numbers), further deliveries were not continued. I have no detailed information on the service of this type in Poland; most probably not a single example has survived until today. As already mentioned, German N3s went mostly to industry; at least one was purchased by the Volksarmee. Two examples (49826/1952 and 49827/1952) were delivered to the state railways DR, but were used solely for auxiliary duties at depots. In 1958 they were re-numbered Kö 5754 and Kö 5755, respectively, i.e. in the manner of pre-war Kleinlokomotiven; in 1970 they were impressed into DR class 100 and re-numbered again, this time 100 954 and 100 955, respectively. Both were withdrawn in 1995; the latter has been preserved and is currently owned by BSW-Gruppe Thüringer Eisenbahnverein. Several more N3s have been preserved in Germany.